There are both destructive and beneficial insects that affect our forests. This article will discuss the destructive kind. There are insects that infest conifers and those that infest hardwoods. This article will discuss the hardwood varieties. Within insects destructive to hardwoods, there are root-feeding insects, defoliators, bark beetles and bark borers, wood borers, twig borers, sucking insects, seed-destroying insects. ROOT-FEEDING INSECTS are mostly a problem in nurseries or young plantations where sod is well-established. If sod or grass is killed well before planting, these insects can be controlled. If the sod is killed after the trees are established, then the insects move to the healthier tree roots. DEFOLIATING INSECTS feed on leaves, weakening trees by reducing their sugar/starch producing capacity. Sometimes infestation of these pests reach epidemic levels. While the loss of leaves slows the growth of the tree, hardwoods can generally survive a few consecutive years of defoliation - although they will be stressed. Fortunately, epidemics are usually cyclic and the insect population will usually crash due to starvation before the forest is irrevocably damaged. The following are defoliators that affect hardwoods: The elm spanworm attacks nearly all hardwoods, but it prefers ash, hickory, and walnut. Its larvae is dark brown to black with a dark red head. Bacillus thuringiensis (Bt) is an effective control of the larvae if applied in the spring. The tent caterpillar attacks most broad-leaved trees, especially aspens and northern hardwoods, as well as fruit trees, and shrubs. the caterpillars feed outside the tents, but return for resting periods. While some insecticides are effective, removing and burning the tents and removing and destroying logging slash, dead branches, and debris which act as breeding sites has an effect. Leafminers bore into and eat the tissue between the upper and lower surfaces of the leaf. The gypsy moth prefers oaks, birch, and aspen, but feeds off a wide variety of species. It does seem to avoid black walnut, unless there is nothing else to eat. The best management approach to this pest is to keep your forest healthy; remove dying or diseased trees and thin to maintain a robust stand. BARK BEETLES OR BARK BORERS may be the most destructive insect group in North America. However, they rarely kill or damage more than a few hardwood trees unless the forest is severely stressed by drought or defoliation. They tunnel beneath the bark and can girdle a tree, thus preventing the normal movement of sugar and water. The first sign of this pest is a reddening or fading at the top of the tree, followed by all the leaves turning brown. These are the common bark beetles/borers: The bronze birch borer affects only birch trees. Its occurrence can generally be prevented by harvesting mature or over-mature trees from your stands. The two-lined chestnut borer used to attack chestnuts. With the decline of that species, this borer now infests oak and occasionally beech. It attacks living trees, usually those suffering from stress. The topmost branches are generally attacked first. The adult emerges and leaves a D-shaped hole. Practicing sanitation and reducing stress on your trees can decrease the affect of this pest. The flat-headed apple tree borer attacks a wide variety of hardwoods, especially those recently transplanted, injured, or weakened. 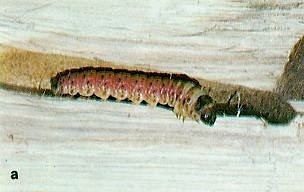 The larvae make meandering galleries and enter the wood to pupate. Again, sanitation and stress reduction are good strategies to fight this insect. Bark borers are difficult to control with contact insecticides because they are sheltered beneath the bark. Systemic insecticides have little effect because these insects disrupt water movement in the tree. Practices that maintain a forest's vigor, such as thinning, provide good protection. WOOD BORERS attack very low-vigor or recently killed trees and are rarely a problem in healthy stands. They drill through the sapwood and even into the heartwood; some infest recently cut logs, lowering their value; and some even attack finished lumber. A telltale sign is often the sawdust or frasse that accumulate outside their entry holes. 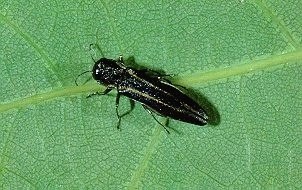 The following are some common wood borers: The carpenterworm attacks oak, elm, locust, and poplar with an angling upward tunnel in the sapwood and straight into the heartwood. Ambrosia beetles are particularly destructive to green lumber. These brown, shiny beetles create circular, open pinholes, surrounded by dark stains. A white boring dust is often found on the infested log's bark. TWIG BORERS affect deciduous trees throughout North America, but their damage is most significant mostly to ornamentals. SUCKING INSECTS feed on plant fluids. While there are many species, few actually kill trees. Their sucking robs the tree of energy, which will affect growth and health. They have been known to spread tree viruses or fungi. General symptoms of these pests are loss of vigor, deformed leaves, yellowed leaves, or dead branches. The destructive stage of the insect is usually required for precise identification. The common sucking insects are: Cicadas which periodically cause mechanical damage to twigs of young hardwoods. Lacebugs prefer yellow birch, basswood, maples, oaks, sycamores, and willows. Conventional insecticides have been shown to be effective for epidemic infestations; contact an entomologist or a pesticide specialist for a recommendation and advice. Scales cover leaves, twigs, or branches with small, circular or oval or elongated shells (or scales). They may also leave small tufts of cottony wax. The oystershell scale affects a variety of broad-leaved trees. Pit scales are essentially aphids feeding in pits formed by swollen plant tissue, primarily on oaks. SEED-DESTROYING INSECTS usually deposit their eggs in a seed. The acorn weevil and the walnut weevil are the more common species in hardwoods. While insecticides can control these pests, they should only be used where seed production is critical or in oak stands where acorn production is important for wildlife. Few insecticides are registered for this use. Most are very toxic and require application by a licensed operator. For many forest insect, mite, and disease pests, suppression methods are either unknown or they are too costly to use except for individual high-value trees. For other pests, suppression is not recommended because natural factors such as adverse weather, parasites, predators, birds, rodents, and diseases normally provide natural biological control. That is one more reason to grow your trees in a biologically-diverse environment.